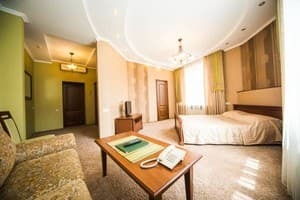 Stylish hotel "Status" is located at the entrance to Vinnitsa from Kiev, 1.9 km from the fountain "Roshen". The three-storey hotel building has spacious rooms in a classic style. 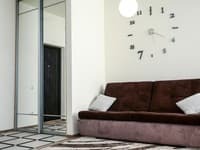 The choice of living rooms with separate or combined beds for non-smokers, also equipped with elegant two-bedroom apartments. Each hotel room provides free WI-FI access, is equipped with international telephone and cable TV. The room includes a climate control system and a minibar. Description of the room: One room in a classic style. Equipped with a double bed and a sofa. Mini-bar is chargeable. For single use there is a discount. Description of the room: One room with twin beds. There is a sofa in the room. Mini-bar is chargeable. Description of the room: A spacious room in pastel colors, equipped with a double bed and a sofa. Mini-bar is chargeable. 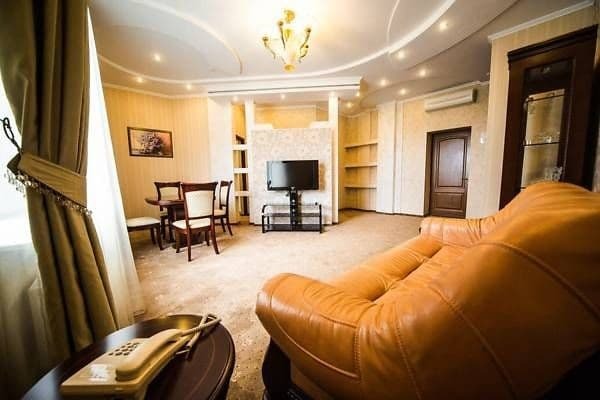 Description of the room: Two-room apartments are decorated in chocolate-pastel colors. The room consists of a bedroom and a spacious living room with an equipped working / lunch area. Mini-bar is chargeable. Персонал, расположение отеля, удобная, просторная комната. Не предусмотрены ланчбоксы в случае, если клиент выезжает раньше 7 утра. Хорошее расположение, пару остановок от фонтана и центра. Чистый, просторный номер. Хороший сервис, приятные сотрудники. Each room has one extra bed - a sofa bed with an orthopedic mattress. The cost of extra bed is 200 UAH / day for 1 adult or 1 child (breakfast is included in the price). For children under 5 years, an extra bed is free of charge. There is a restaurant on the first floor of the hotel. The restaurant serves only hotel guests. 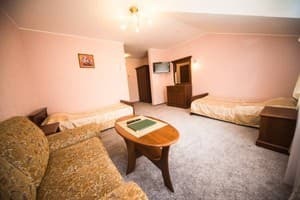 Hotel "Status" is located at the entrance to Vinnitsa from Kiev, 1.9 km from the fountain "Roshen". The distance to the central square of the city is 2.6 km, the railway station is located 3.7 km. City transport from the central bus station: trolleybus № 6, 2; Route taxi 20A, 17A, 16B, 3A (distance 1,9 km, approximate travel time 6 minutes) - go to the stop "2nd city hospital".